This report details a case of the troublesome open cavity with recurrent infection treated by radical disease clearance, eustachian tube opening obliteration, and the blind sac external auditory canal closure (Rambo operation). The advantages and limitations of such an approach in the context of modern imaging and the reconstructive techniques available are discussed, to formulate the probable indications and contraindications for the procedure. A 16-year-old female with history of left-ear discharge and impairment of hearing for 3 years was operated by her local ENT practitioner. She initially had a myringoplasty in April 2007 and subsequently a modified radical mastoidectomy with type2 tympanoplasty for persistent discharge in August 2007. Subsequent to this, the patient continued to have persistent discharge and also developed ipsilateral sensorineural hearing loss. In August 2008, she had another revision mastoidectomy and histological evaluation of the mastoid epithelium indicated chronic inflammatory granulation tissue. The otorrhea persisted and a further presumptive course of antitubercular therapy was prescribed but to no avail. The patient was then referred to our facility for further management of persistent ear discharge. On clinical evaluation, the patient's left external auditory canal was completely filled with granulation tissue and purulent discharge. Hearing evaluation indicated left sided profound sensori-neural hearing loss, with normal right sided hearing. Examination of the nasopharynx and nasal cavity was normal, as was the rest of the otorhinolaryngological evaluation. Specific attention was focused at all the listed causes of recurrent-ear discharge following mastoidectomy as enumerated in [Table 1]. Further evaluation included histological and radiological evaluations. Biopsy from the mastoid tissue demonstrated acute inflammatory granulation tissue with no suggestion of granulomas. 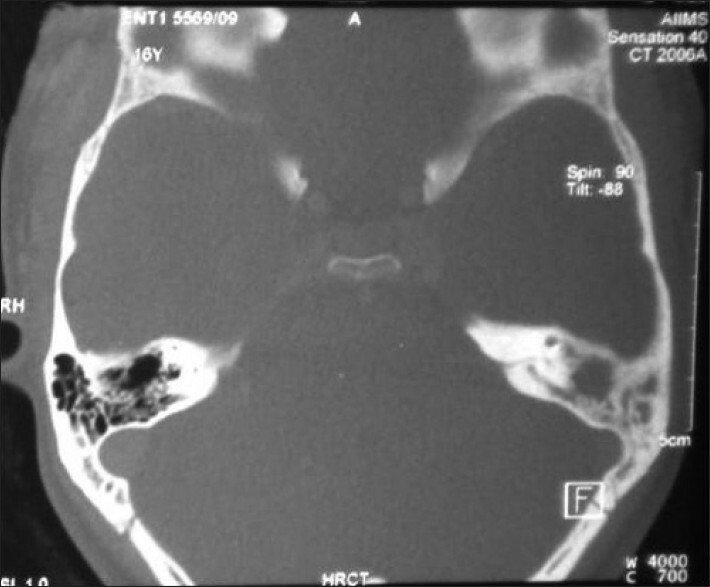 High resolution CT (HRCT) of the temporal bone showed a postoperative cavity with no ossicles and a possible lateral semicircular canal fistula along with soft tissue in the middle ear [Figure 1] and [Figure 2]. The petrous apex was normal and symmetrical and further no erosion was noted at the dural plate, sinus plate, and Fallopian canal More Details. A revision mastoid exploration was planned. Since clinical, laboratory, and radiological evaluation had not pinpointed a specific cause, the major differential diagnosis at the time of undertaking surgery included deep bony osteitis, tuberculosis, or a tendency toward inadequate healing (ie, exuberant granulations/exuberant fibrosis and keloid formation). The patient underwent left-ear radical mastoidectomy with complete tympanomastoid obliteration, along with closure of external auditory canal in August 2009. A postauricular incision was used and overhanging edges of cavity were smoothened, the dural and sinus plate were delineated, the facial ridge was partly lowered and granulations were cleared from the mastoid cavity, attic and middle ear after identifying the tympanic segment of facial nerve with the help of a facial nerve monitor. The tympanic segment was found to be dehiscent anteriorly and was enclosed by granulations all along its course, which were cleared carefully avoiding trauma to the nerve. With the help of the nerve stimulator, the vertical segment was also identified and cleared of granulations. A complete radical mastoidectomy was performed and eustachian tube was obliterated with bone dust and the mastoid cavity with abdominal fat. The external auditory canal was sectioned and its skin everted and closed in a blind sac, along with reinforcement by a periosteal flap. The patient had an uneventful postoperative recovery with rapid healing of the postauricular and EAC suture lines. Histological evaluation of the surgical tissue excised from the tympanomastoid cavity indicated only inflammatory granulation tissue with no evidence of any chonic granulomatous disease. No further episodes of discharge have been noted over a follow up period of 1 year. A radiological evaluation (MRI - delayed gadolinium enhanced, T1- weighted sequence in combination with nonecho planar imaging, diffusion weighted sequences) at 1 year of follow up showed no evidence of recurrence and the patient is further scheduled after 18 months for a repeat scan. A CWD mastoidectomy remains the standard surgical procedure for cases with attico-antral chronic suppurative otitis media. Recurrent or persistent-ear discharge following a mastoidectomy is however not uncommon. This can be consequent to the nature of the disease process (granulomatous inflammation/osteitis/osteomyelitis), or consequent to the anatomical limitations to complete disease clearance and mucosal clearance posed by the crowded vital structures in the temporal bone. Technical inadequacies in the surgical procedure, and the vagaries of healing in the postoperative period, are probably the most frequent causes of persistent discharge. 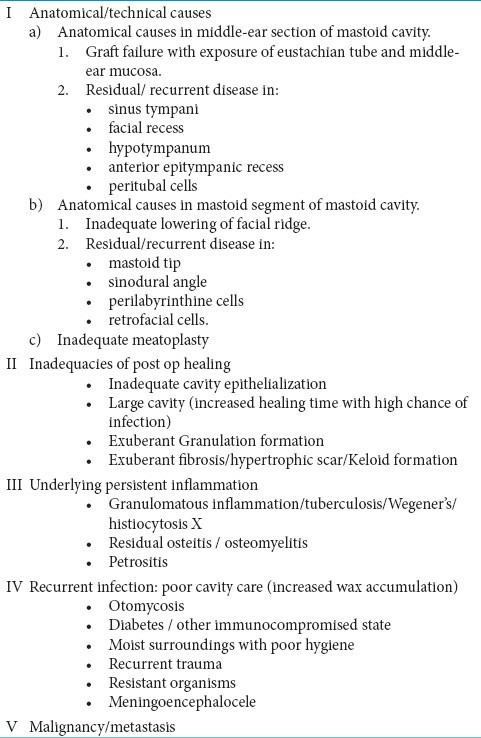 [Table 1] lists the common causes of persistent discharge following mastoid surgery. However, despite attention to all the technical factors as listed, there continues to remain cases wherein a dry ear is not achieved with the usual treatment administered. This report presents the successful utilization of complete mastoid obliteration for a case with recurrent otitis media and persistent-ear discharge despite three previous surgical operations. This surgical option is demonstrated to be successful in achieving a dry ear in the majority of cases with none of the vagaries of healing of secondary intention as are inevitable in conventional CWD mastoidectomy. The obliteration option however runs the risk of embedding epithelium or mucosa, or infection in the closed mastoid space so created, with a potential for delayed complications. Therefore, it is not used as a first line option, but is indicated in situations where in the conventional options like radical or modified radical mastoidectomy have not proved successful in providing a dry ear. 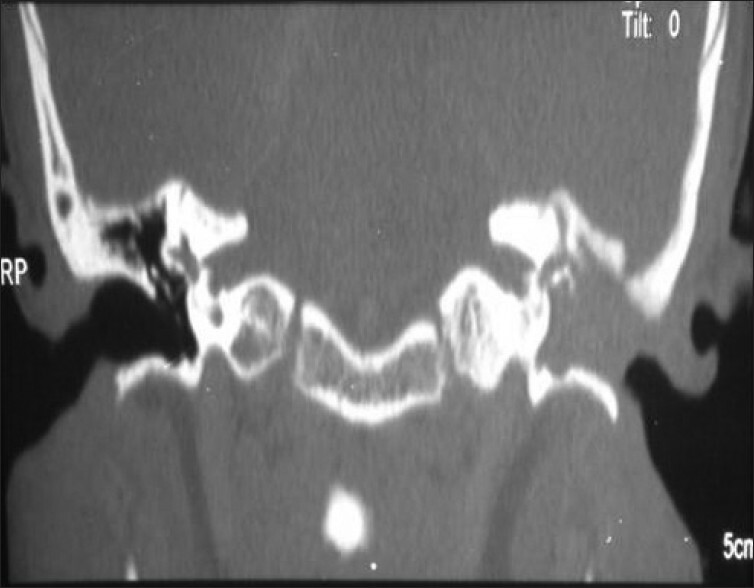 At the time when this operation was initially proposed (1958), there was significant concerns about the residual epithelium or mucosa which would be buried in the mastoid cavity and could lead to subsequent complications and suppuration, particularly in a well-pneumatized temporal bone, wherein it may be impossible to remove mucosal or epithelial invaginations in the peripheral cells insinuated in the perilabyrinthine or retrofacial cell tracts. Current surgical techniques and surgical armamentarium such as magnification and high-speed drills do ensure better disease excision, but concerns of residual mucosal or epithelial disease being left behind do remain. The recent development of imaging techniques (MRI: delayed gadolinium enhanced, T1: weighted sequence in combination with non-echo planar imaging, diffusion weighted sequences) as development for the detection of cholesteatoma following CWU techniques, can however also be applied in this situation for early detection of residual epithelium progression to cholesteatoma. In this, particular patient being reported, an MR evaluation at 1-year postsurgery demonstrated no residual/recurrent cholesteatoma. A repeat MR is planned after another 18 months or earlier if indicated. Further the surgical option of cavity obliteration and sealing of the ET and EAC necessarily leads to a maximal conductive hearing loss. In this particular case under report, this was not of consequence due to the associated sensori-neural hearing loss, but this can be consequential in other situations and especially if the other ear too has subnormal hearing. However, in the setting of cases with recurrent otorrhea persisting despite multiple-ear surgeries, it is often the case that the local pathology and the poor eustachian tube function render the situation to be less than ideal for a reconstructive tympanoplasty, and a significant degree of conductive deafness may have to be accepted even with other surgical options. Though most cases of CSOM are managed by conventional measures, some patients have recurrent infection of the cavity warranting multiple treatment episodes. In such cases complete tympanomastoid obliteration with fat obliteration and EAC blind sac closure (Rambo operation) is a surgical option with a high success rate. Concerns of burying epithelium, and of subsequent silent and buried recurrent/residual cholesteatoma can be currently addressed by specific MR scanning for follow-up evaluations. Informed counseling of the patient with regard to significant conductive hearing loss and also the need for follow-up MR evaluations is however imperative. 1. Glasscock M, Miller GW. Intact canal wall tympanoplasty in the management of cholesteatoma. Laryngoscope 1976;86:1639-57. 2. Nyrop M, Bonding P. Extensive cholesteatoma: Long-term results of three surgical techniques. J Laryngol Otol 1997;111:521-6. 3. Austin DF. Staging in cholesteatoma surgery. J Laryngol Otol 1989;103:143-8. 4. Brown JS. A ten year statistical follow-up of 1142 consecutive cases of cholesteatoma: The closed vs. the open technique. Laryngoscope 1982;92:390-6. 5. Lau T, Tos M. Treatment of sinus cholesteatoma. Long term results and recurrence rate. Arch Otolaryngol Head Neck Surg 1988;114:1428-34. 6. Mosher HP. A method of filling the excavated mastoid with a flap from the back of the auricle. Laryngoscope 1911;21:1158-63. 7. Mehta RP, Harris JP. Mastoid obliteration. Otolaryngol Clin North Am 2006;39:1129-42. 8. Rambo JH. Primary closure of the radical mastoidectomy wound: A technique to eliminate post-operative care. Laryngoscope 1958;68:1216-27. 9. Kos MI, Chavaillaz O, Guyot JP. Obliteration of the tympanomastoid cavity: Long term results of the Rambo operation. J Laryngol Otol 2006;120:1014-8. 10. Browning GG. The unsafeness of safe ear. J Laryngol Otol 1984;98:23-6. 11. Agarwal D, Suri A, Mahapatra AK. Primary excision of pediatric posterior fossa abscesses - Towards zero mortality? A series of nine cases and review. Pediatr Neurosurg 2003;38:63-7. 12. Fantuzzi G. Adipose tissue, adipokines, and inflammation. J Allergy Clin Immunol 2005;115:911-9. 13. Cousin B, Munoz O, Andre M, Fontanilles AM, Dani C, Cousin JL, et al. A role for preadipocytes as macrophage like cells. FASEB J 1999;13:305-12. 14. Cousin B, Andre M, Casteilla L, Penicaud L. Altered macrophage-like functions of preadipocytes in inflammation and genetic obesity. J Cell Physiol 2001;186:380-6. 15. Weisberg SP, McCann D, Desai M, Rosenbaum M, Leibel RL, Ferrante AW Jr. Obesity is associated with macrophage accumulation in adipose tissue. J Clin Invest 2003;112:1796-1808. 16. Sanna M, Dispenza F, Flanagan S, De Stefano A, Falcioni M. Management of chronic otitis media by middle ear obliteration with blind sac closure of the external auditory canal. Otol Neurotol 2008;29:19-22.